The first Firefox build of uMatrix has been created by Gorhill on Github. The release is dubbed a "very early preview" and users are asked not to file feature requests currently. The Firefox version of uMatrix is currently only available on Github from where you can download and install it in the browser. Please note that only the English version will display properly while you may get missing strings in the options in other versions. If you never heard about uMatrix before you probably wonder what it does and how it differs from Gorhill's uBlock extension and similar Firefox extensions such as NoScript or RequestPolicy. The main difference between uBlock and uMatrix is that uBlock uses pattern-based filtering while uMatrix matrix-based filtering which gives you more control over the filtering process. Then there is also Policeman which gives you finer controls but may not be as easy to use as uMatrix. In comparison to NoScript, it is offering finer controls when it comes to content types to block. While NoScript does support custom site exclusions, it is not as easy to setup, and as far as RequestPolicy is concerned, it is more of a allow or deny type of program with little granularity. The extension works like a firewall basically that gives you control over what is loaded when you connect to web pages in the browser. It adds an icon to the Firefox toolbar that highlights the total number of items on the site and displays visually if all or some are blocked. A click on the icon displays an easy to use menu listing the main site and 3rd party site connections and content types as well as whether those have been blocked or not. Colors indicate whether contents were loaded or blocked during connect. A click on a column header provides you with options to handle permissions for all or only first party sites. It is easy enough to switch between allow and disallow states this way but the controls go further than this. A click on a cell toggles permissions for the site and content type it refers to. The opposite if that is the allow all option which you enable with a click on all in the table. While that improves site compatibility by a lot, it removes most benefits that uMatrix offers. If you use site-specific permissions, you will encounter sites that break. That's only natural as some contents that may be required for the site to function properly are simply not loaded on first connect. One interesting feature is the ability to make permissions site-specific. Want to display advertisement on one site to help out the webmaster and support the site? You can do that without having to enable ads from a particular advertiser on all other sites. The uMatrix extension uses various host files that help it further when it comes to resource blocking when connecting to web pages. Options to add permanent and temporary rules are provided and you find a bunch of privacy related settings as well. Use them for instance to delete blocked cookies (which are not prevented from being set but prevented from being read), or to delete non-blocked session cookies after they have not been used for a specific amount of time. The current version of uMatrix for Firefox is a port of the Chromium version. Gorhill plans to make Firefox-specific changes to the extension in the future to make use of additional controls that Firefox offers that Chromium does not. It is a work in progress right now and should be handled as that. The author of uMatrix Gorhill has just created the first build of the extension for the Firefox browser. I know many shy away from NoScript, claiming it’s too complex and leads to too much breakage, but I actually revel in the kind of expanded granularity that add-ons like µMatrix offer. I have been testing µBlock as a replacement for AdBlock & also Policeman, but it lacks the finer control of the latter. Policeman is a brilliant tool, and µMatrix seems to be on par at first sight. Don’t think I agree that Policeman is probably less easy to use, I’ve found it pretty intuitive all in all. Nonetheless, I look forward to µMatrix’ development, will be test-driving it as Policeman takes a back seat. Exactly, Policeman is pretty easy to use once you get used to it. Right now it’s my no.1 extansion however I still need to use uBlock as Policeman alone does not block trackers and ads hosted on the same domain. I’ll check what uMatrix can do in that regard. I want to adopt one but which one? Depends on what you want to use them for. If you just want blocking functionality then uBlock Origin could be your first try but if you want control over every connection made, then you may want to give uMatrix a try first as it does that. i have to admit, i felt the same way in regards to all those blockers and such. i think if all this talk is confusing to you, you should just start out with ublock origin, as martin says. i see addons like adblock plus/edge/whatever and ublock origin more as “simple” adblockers, that simply do their job and don’t need much effort to set up. 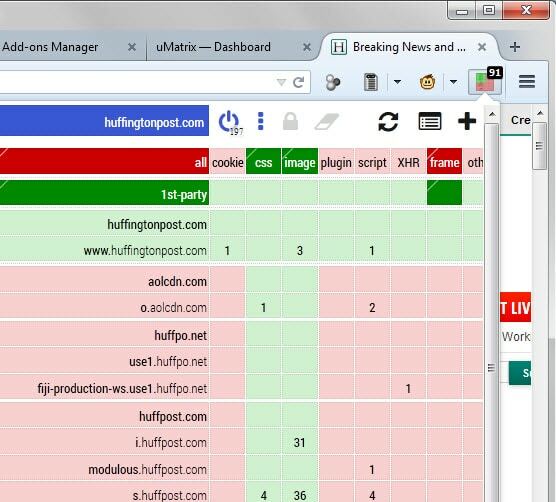 uMatrix and other more granular addons like noscript and policeman allow for a much more in-depth approach for blocking not only ads, but also plugins and other stuff, good or bad, that websites might use. some people love having full control over everything and every site they ever visit, but for me those solutions seem to be overkill and too much work when i simply want to surf the internet. ymmv. i hope i could clear things up a little. ublock origin is the adblocker to get right now, umatrix etc is for people that want even more control over the websites they visit. You’ve forgot µBlock and uBlock Origin. But no matter I’m very happy with uBlock and will try now uMatrix and see if that’s really better or not – anyway great addons (must have). There is a Chrome version. That thing is way too complicated for me. I had to uninstall it. Since µMatrix has no element picker, how do I block one element (permanently) on a page? You can’t, as uMatrix isn’t for blocking elements. 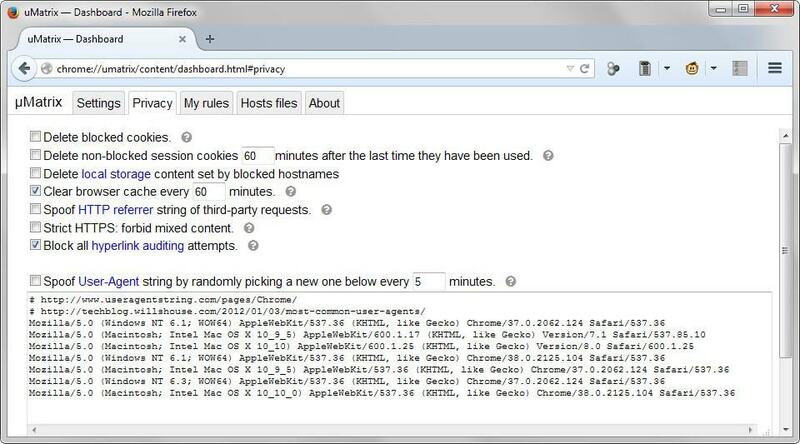 It acts more like a firewall to block entire unwanted sites, or allow only images/scripts/etc. from specific sites. To block elements, you can use uBlock or Adblock Plus or other similar tools. What is the difference between Ublock with Dynamic filtering set to default deny and uMatrix? uMatrix allows for more fine-grained control. For example, you could allow images and CSS from a third-party site but not allow any scripts from that site. Oks thanks. Maybe I’ll make the change then. If you are going to use uMatrix, then you don’t need RequestPolicy, and you could probably set NoScript to ‘Scripts Globally Allowed’. uBlock is probably a better choice than ABP+EHH. And with uBlock+uMatrix, you’re unlikely to have conflicts, since they’re from the same developer. uBlock and uMatrix work very well together once configured correctly. Thanks for the info about this, Martin. uMatrix is working out quite well for my own needs. I’ve decided to use it for blocking connections, along with uBlock-Origin (in static mode) to block ads. uMatrix is really simple to understand and use after studying the matrix layout for a few minutes, then doing a little experimenting. I highly recommend this add-on for anyone that is particular about connections to their computer.